Background: Cardioselective beta-blockers may affect glucose or lipid profiles. Objective: We sought to compare the effects of two beta-blockers, metoprolol and bisoprolol, as the most commonly used drugs in cardiology, on glucose and lipid profiles in patients with cardiovascular diseases. Methods: We conducted a retrospective cross-sectional matched study at Prince Sultan Cardiac Center in Burydah in August 2017. Patient records were screened, and adult patients with cardiovascular disorders who were treated with a stable dose of metoprolol or bisoprolol were included. 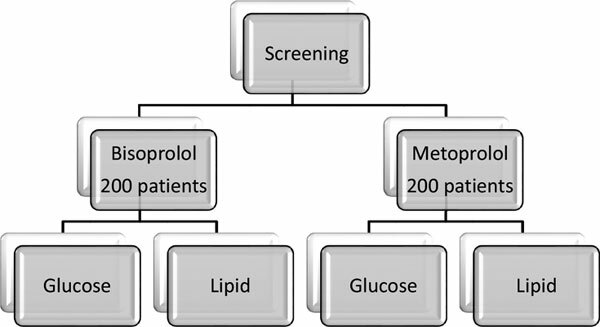 Parameters related to glucose and lipid metabolism were compared using the Student’s t-test between the two groups. Results and Conclusion: The metoprolol and bisoprolol arms included 204 and 200 patients, respectively. Metoprolol, bisoprolol, triglycerides, glucose, lipid, triglyceride.